Karen Richardson from Victor, Idaho, was one of several parents chaperoning a group of students on a field trip to Yellowstone National Park, Wyoming, last week. Law enforcement rangers were called and the father-and-son tourists, who were from another country, were ticketed. Heusevelet says the rangers followed the pair back to where they had picked up the bison, and the animal was released. Yellowstone visitors are not allowed to approach wildlife and are to stay at least 25 yards away from large animals. Update: the calf is dead. Morons. 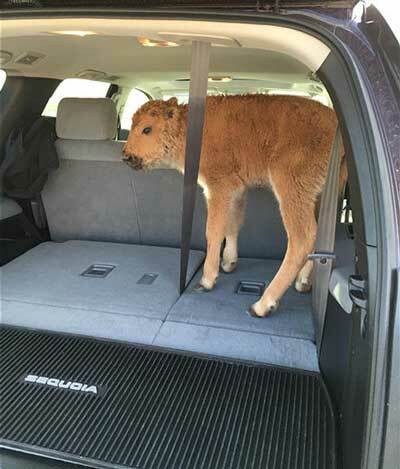 "The bison calf was later euthanized because it was abandoned and causing a dangerous situation by continually approaching people and cars along the roadway." Thanks for the update, Emma. Wow, the poor animal. Some humans are very stupid. sad. I also read that he was euthanized because the herd rejected him. I hope that's the real reason.